CONGO to denote service with the ONUC Mission (1960-1964). 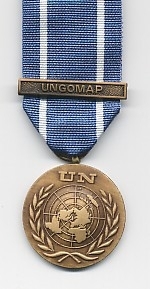 For service with the UN Good Offices Mission in Afghanistan and Pakistan (1988-1990). OSGAP to denote service with the Office of the Secretary-General in Afghanistan and Pakistan (1988-1990). UNHCR to deote service with the UNITED NATIONS High Commission for Refugees. UNSCOM to denote service with the UN Weapons Inpectors in IRAQ. 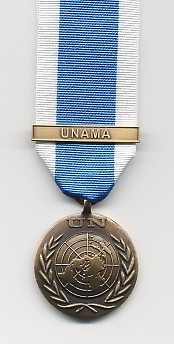 For service with the UNITED NATIONS in Croatia. UNMONUA for service with the United Nations in Angola. UNMIH for service with the United Nations Advanced Mission in Haiti. UNSMIH for service with the United Nations Support Mission in Haiti. UNTMIH for service with the United Nations Training Mission in Haiti. 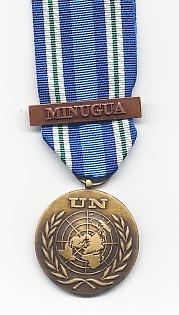 MINUGUA for service with the United Nations in Guatemala. AN ORIGINAL ISSUE FULL-SIZE MEDAL IN MINT CONDITION.